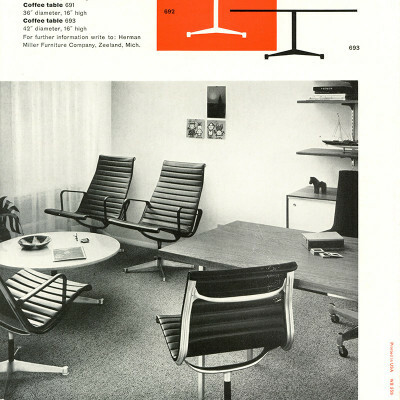 What were the Eames Contract Base Coffee tables? Released in 1957, as part of the Alu Group range of furniture, the Eames Contract Base Coffee Tables were a selection of small side tables designed to compliment both chairs and larger dining tables through use of a common base type. Originally just called 'Alu Group Tables' both the dining and coffee sizes became known as the 'Contract Base' table following widespread practical use of the group within commercial settings. Standing at 16 inches in height, the Eames Contract Base coffee side tables were generally meant to most compliment the use of the Alu Group Lounger or Recliner in a lounge setting. 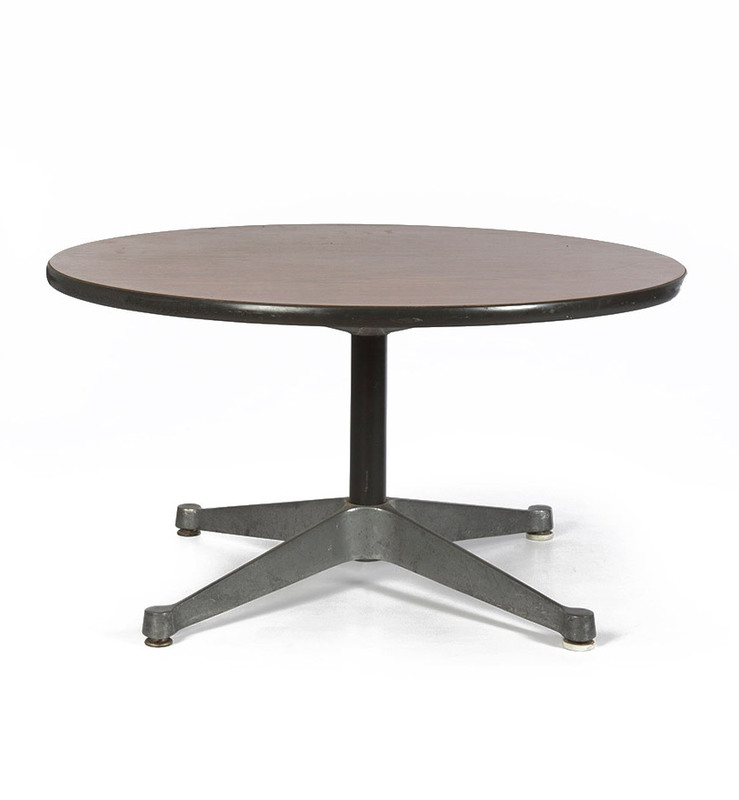 The Contract coffee tables were initially released with two choices of circular top sizes, 36 and 42 inches in diameter. These first early tables were available in either a white plastic finish (models 661 & 663) or for outside use in either opaque white glass or Botticino marble (models 691 & 693). The early 1960's would see a third size of 48" introduced for the plastic only tables (model 667). By 1964 the popularity of the Alu group was growing and the tables could be ordered with square tops, custom sizes and in a range of natural wood veneers in addition to plastic. 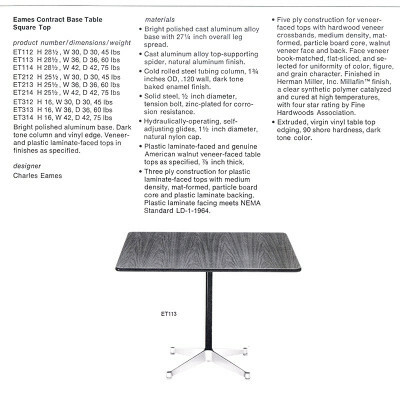 A 54" diameter top was also added to the range in 1964 and by the 2000's the tables had been available in multiple plastic colors, faux veneer, real wood veneer and natural stones. 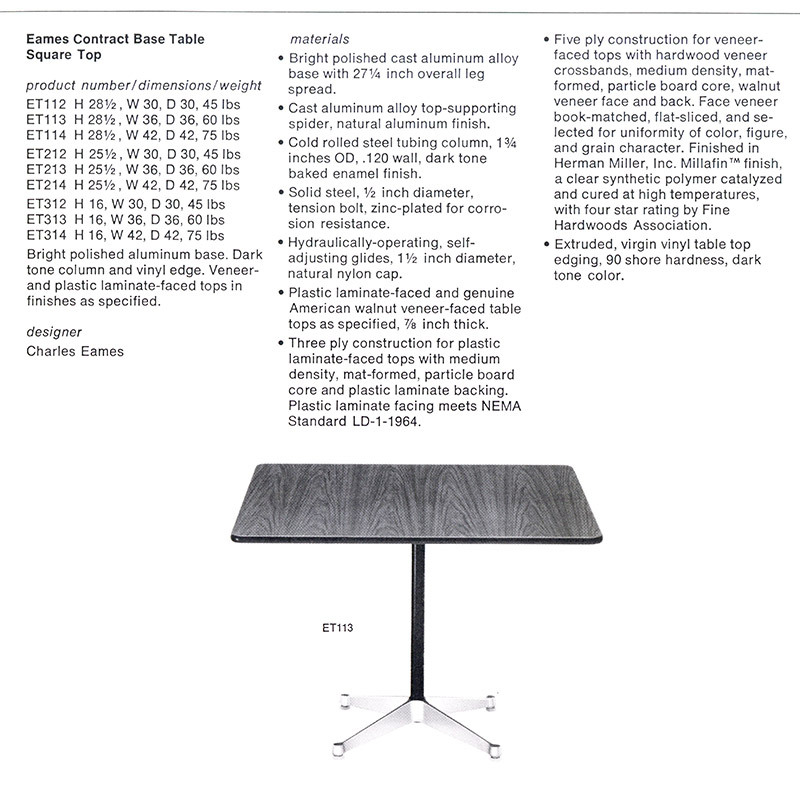 The Eames Contract Base tables were a catalog mainstay with Herman Miller, changing model numbers to ET307 through ET314 in the 1970's. 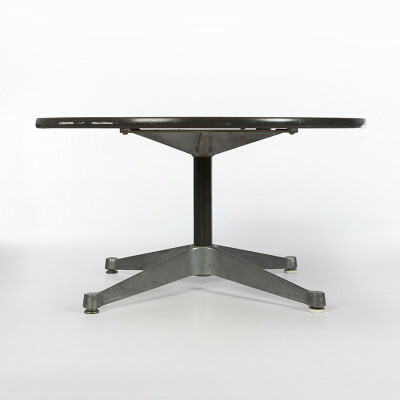 The tables remained on the catalog well into the 2000's and are available on request today. 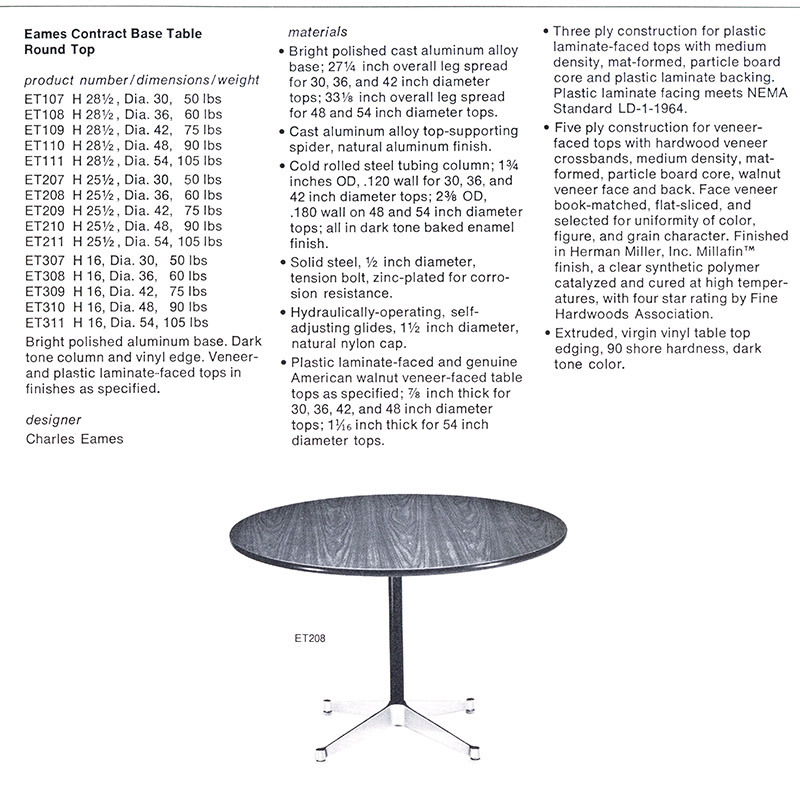 What were the original specifications of the Eames Contract Base Coffee Table? 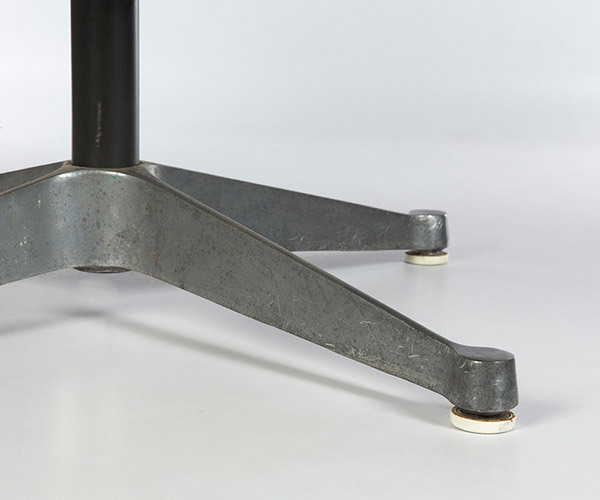 The Eames Contract Base Coffee Side Tables were all sold with a fixed height of 16 inches. 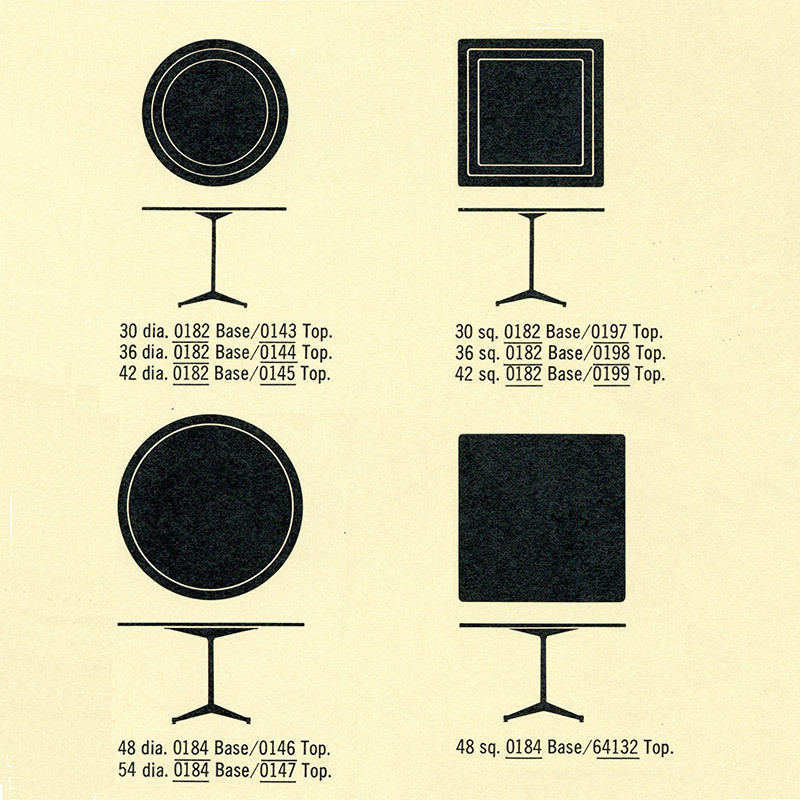 The catalog sizes of the tables were 36, 42, 48 and (later) 54 inches in diameter as well as 30, 36 and 42 inches in later squared versions. 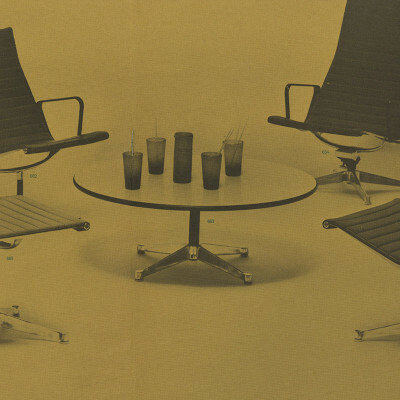 The tables were found in a multitude of popular finishes over the years and for a period of time Herman Miller offered customization of the top sizes, most likely into specific commercial settings. 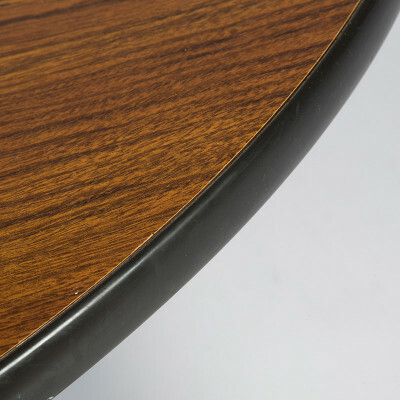 What variations of top finishes were available with the Contract Based Coffee Tables? 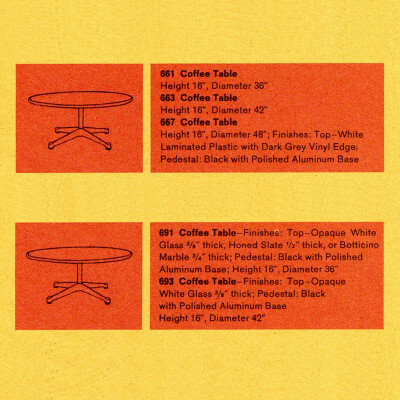 The below extract is from the 1964 Herman Miller catalog and depicts the custom book options for the Contract Base Coffee Side tables. The 48 and 54 inch diameter top versions had ever so slightly enlarged bases in order to distribute the extra weights. 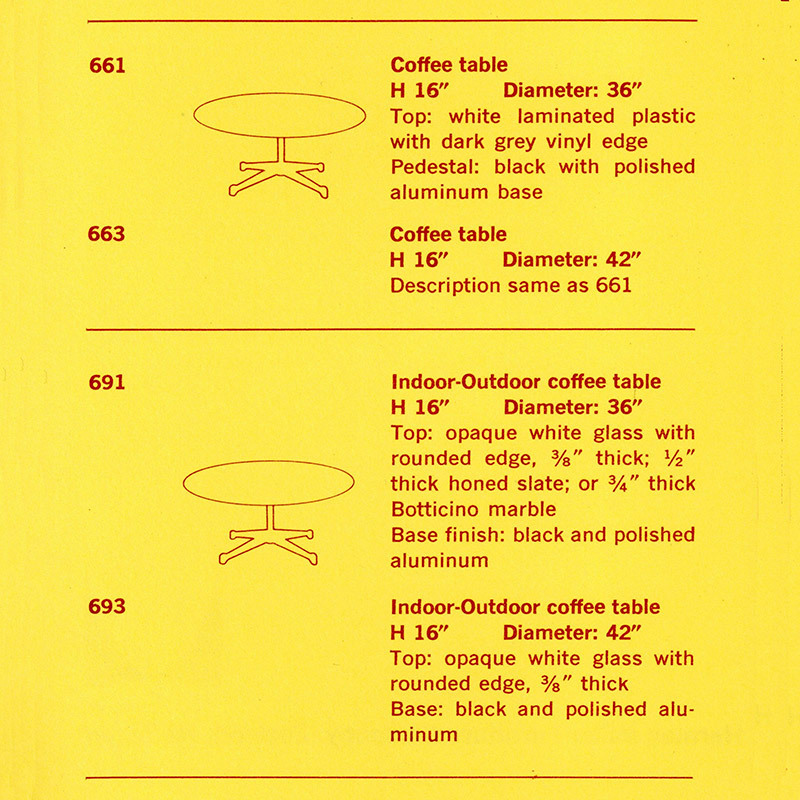 The Herman Miller 1964 extract displaying varying circular and (for the first time) square table tops for the contract base dining, work and coffee side tables. 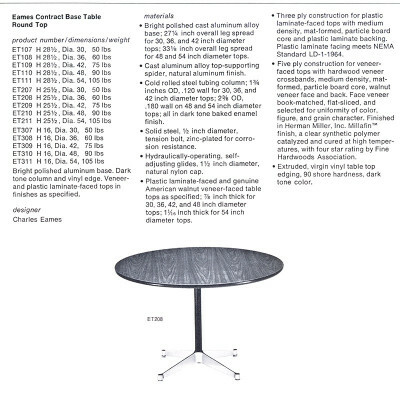 Is my Eames Contract Base Coffee Table authentic? What makes it valuable? 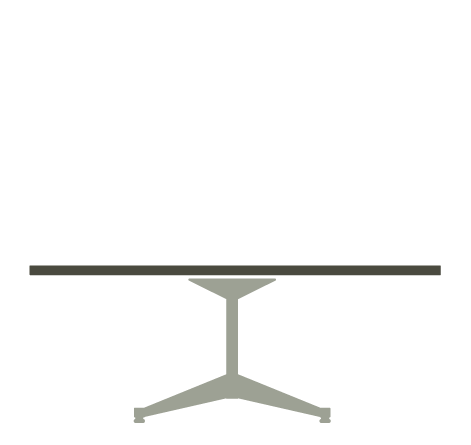 Eames coffee tables of all types have been copied considerably over recent years. That said, most reproduction coffee tables tend to be those of the plywood group or that with the Universal Base. Even so, it pays to be vigilant and authenticity is always helped greatly by the presence of original Herman Miller labels, used throughout the decades. As versions of the table are still made today there will be varying degrees of wear and patina to be found. Vintage versions should show plenty of natural tarnish to the Aluminum base whereas newer ones will likely be still bright and shiny. 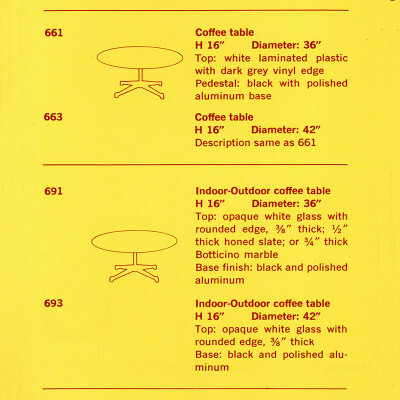 Ensure the table appearance matches that of the age it claims to be through stamps or labels. Value is driven by three factors, the age, the finish type and the condition. That biggest driver of the three is the finish with natural stone and real wood veneer types usually yielding the highest prices, especially that of marble, Natural Rosewood or Walnut. Then condition will determine how desirable the table is and those with proven vintage will appeal greatly to collectors.